Wow! Baby Hazel finds a cute little rabbit in her garden. She names him Honey Bunny. She must learn how to take care of her cute new pet with your help. Use the mouse to position people and objects as they appear in thought balloons or are pointed at by a floating hand. Keeping Baby Hazel and Honey Bunny happy will earn you extra points. You have a couple minutes to complete each section! Poor Honey Bunny is stuck in the mud. The little rabbit is so dirty! Pick up the rabbit. You’ll have to bring her to the bathroom for a thorough cleaning. Fill the tub with water from a cup. Grab the soap and lather up Honey Bunny. Move the soap in a circular motion until bubbles appear. Towel off Honey Bunny. What’s that? A boo boo! Poor Honey Bunny will need a shot. Put a band-aid over the boo boo. All better! Honey Bunny is hungry! Baby Hazel is going to take care of this. There’s plenty of food in the refrigerator. Rabbits love carrots and lettuce. Honey Bunny is willing to try some eggplant. Put some milk in a bottle as well! Rabbit food is Honey Bunny’s favorite. Feed it to her with a spoon. Honey Bunny may hop away from the table. What a silly rabbit! Grab her and put her back before Baby Hazel gets upset. Honey Bunny is excited. Let’s make her a little home! Grab the tray and fill it with rabbit things. Don’t forget the water bottle. Put Honey Bunny inside! She likes her new home. Especially the water bottle. It’s fun having a pet! Bring Honey Bunny to the backyard and play ball. Honey Bunny is also very good at hide and seek. Make sure to clean up any mess with a broom. Who would have guessed that Honey Bunny could juggle? The Baby Hazel games at www.gamesbabyhazel.com are fun for all ages. This game is designed to help young children to develop hand-eye coordination as well as pattern recognition. Be sure to try out our many other fun games at our site! One day Baby Hazel finds a cute little rabbit in her garden. She takes the rabbit home and looks after him with love and care. Baby Hazel names him Honey Bunny. 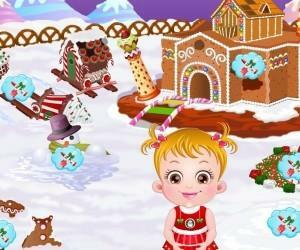 In this game, Baby Hazel learns how to take care of her little pet, Honey Bunny. She needs your help in learning pet care activities like bathing the pet, feeding, playing with pet and finally building a home for the pet. To earn more points, keep Baby Hazel and Honey Bunny happy throughout the activities by fulfilling their needs. So, get ready and have fun!! !